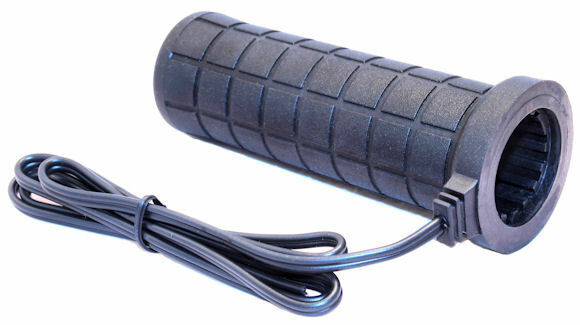 Fits any ATV (with 7/8" bars).�This grip is 4.75" long. Our Unique internal Heat Isolation Ribs reduces heat transfer to the handlebars and keeps the heat where it is needed - the rider's hands. Comfort-Sized grip naturally reduces wrist and hand stress. This grip is a bit larger�in diameter than most ATV grips and universally praised for its comfort. AVAILABLE WITH OPEN ENDS to accomodate handguards or other accessories that�insert into the outer ends of your handlebars after installation. Thick double�reinforced End Cap protects this grip from crash damage. CUSTOM OPTIONS - all our grips�have a three position (high,low, off) weatherproof toggle switch. Optionally you can substitute a handlebar mounted switch, mini toggle switch or infinitely variable heat controller.